Interview With Javier Bardem: Best Bond Villain Ever? Is Skyfall the best Bond movie ever? Some critics think so, and that’s not necessarily untrue. The 23rd installment of the longest-running film franchise ever (50 years!) is certainly the best of the Daniel Craig pics, and Javier Bardem’s deliciously wicked blonde-haired villain Silva plays a huge role in that. 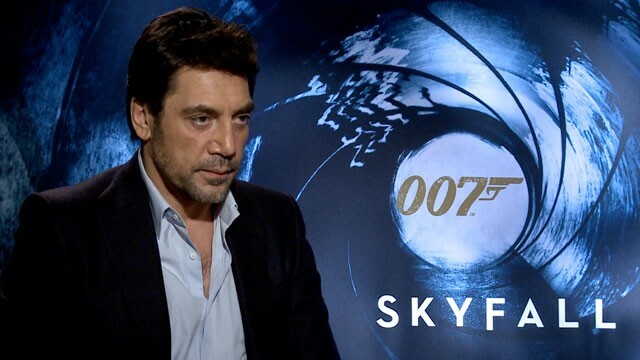 Watch here as the Oscar-winning Spaniard breaks down the psychology of his bad guy for me during the recent Skyfall press junket in NYC. Yes, it was as awesome as it sounds to meet him. If Silva reminds moviegoers of The Joker or other classic comic book villains that’s not a total coincidence, says Bardem. He actually spent time sketching the character, using the skills he acquired during his time studying fine arts in Spain. He then brought those to Mendes and they jointly arrived at this “broken man,” who is so focused on revenge that he will stop at nothing to achieve it. Can Bond fight such a monster, now that he’s aging and got an alcohol problem? You’ll just have to watch, starting November 9.